He removed the bird-feeder from the plant, gave me 2 leaflets of safety instructions for myself and the kitties. 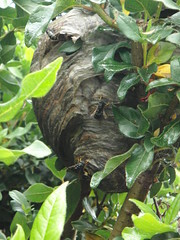 Then insectacide blasted the nest. Dead wasps sit like statues on the outside. You can see them if you squint at this picture or look at the full-size version on flickr. This scribble was published on Friday, July 16th, 2010. You can follow any banter on this scribble with the RSS 2.0 feed. You can leave a response, or trackback from your own site. They look almost hornet-esque! Fascinating… but just a bit too scary to keep on the window sill.